Pete Stockel, innovation autonomy challenge lead for Dstl, said: “Following the communique signature between the two nations in 2014, we have been working closely with our American counterparts to develop effective demonstrations and assessments of important new autonomy technologies, which could one day reduce the burden on and risk to the military user, while improving logistics efficiencies and interoperability. 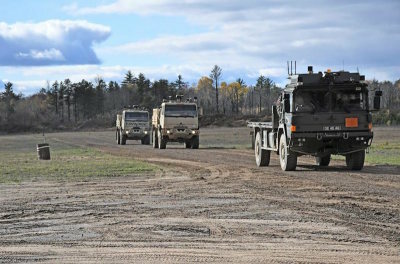 “This is the first time that we have created a UK-US coalition semi-autonomous leader-follower convoy to bring to life concepts which will provide solutions to de-risk the Last Mile of logistics support to the front line. The MOD spends 1.2% of its £36 billion defence budget on science and technology. In September Defence Minister Harriett Baldwin announced the 25 winners of the Last Mile Challenge, up-and-coming tech startups and entrepreneurs hoping to bring innovative solutions to resupply the frontline.